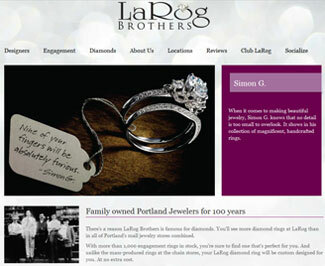 LaRog Brothers of Portland came to Fish Marketing to bolster their digital marketing presence. We created a comprehensive solution that included a new website, designer gallery, blogging, social media integration and Club LaRog—an email marketing program. Their new digital footprint is promoted through local & organic search marketing, pay-per-click advertising and social influence marketing. The results blew LaRog away and we’re now working on similar campaigns for jewelers in two top 30 markets. We invite you to explore the new www.larog.com. While you’re there, check out some of the coolest features, like the engagement gallery, Club LaRog and Dave’s Gems.